Battle Group Ops - RESDES (Rescue Destroyer. 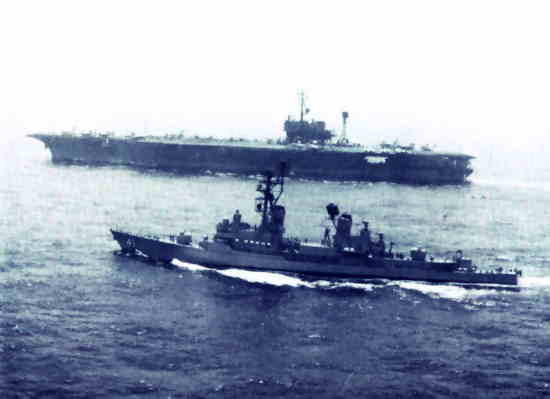 HMAS Brisbane & USS America Persian Gulf 1984. Part of being involved with the 'Battle Group' is taking your turn as' Plane Guard' or RESDES. The same job the ill fated HMAS Voyager and USS Frank E. Evans were carrying out when they collided disastrously with aircraft carrier HMAS Melbourne in 1964 and 1969 respectively. The job was simple enough, just sit off her quarter about 1 mile and be there should one of her aircraft be forced to ditch in the sea. The carriers also fly aircraft on and off continuously, 24 hrs per day, whether a ship is alongside refuelling or not, the hiss of the steam catapult, the deafening roar of the jet fighters and bombers, and main broadcast announcements all adding to the atmosphere. One night in 1981 whilst operating with America it was decided at midnight we would go up alongside to carry out a 'Jackstay' transfer. It was the middle of the monsoon season in the Nth West Indian Ocean and there was a huge swell running. USS America, so as to enable her to continue flying ops steamed into the wind and we were to take up station 100 feet off her starboard side from which position to commence the transfer. It was a filthy night and we had the swell from directly astern, our Chief Coxswain had been medivac ed out of the ship in Trincomalee and CPOUC Max Turner was on the wheel. Steering was difficult as the swell picked up the stern, lifted it out of the water and surfed her in whichever direction she wanted. After a very laborious approach we finally made it alongside and commenced passing the lines. Max was wrestling hard with the helm finding it extremely difficult to keep on course as the swell drove us in its own direction, (reminiscent of a shopping trolley). As we finally 'hooked up' an extraordinary wave picked up our stern and surfed us in toward America. The distance started closing rapidly, and the entire RAS Party turned, looked up at the towering aircraft carrier, threatening to engulf them. We were moving quickly now and we could see the Yank sailors looking down upon us from the overhangs. 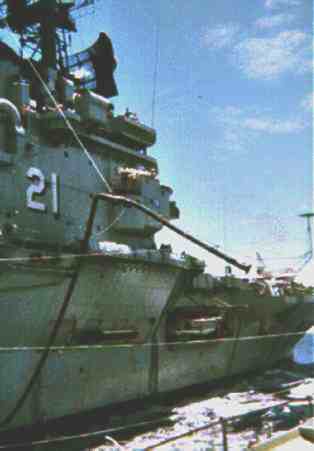 Memories flashed through my mind about the US Cruiser 'Belknap' getting too close and being sucked into to a carrier's vortex and being pulverized, caught beneath the carriers overhangs. It now seemed as if we were going to 'touch' and I looked at my 40 or so seamen manning the jackstay, they were recovering it as quickly as possible as the distance between the two ships closed, all the while, heads turned, eyes wide, watching this big steel monster loom over us in the pitch black night. Captain Jim Dixon, having had enough games for one evening, calmly advised the Navigating Officer to quote 'get us out of here!' We increased revolutions on main engines and put the wheel over 20 degrees to starboard and at last finally started pulling away from America. The sailors standing down aft on the quarterdeck almost being able to reach over the guardrail and touch America's Hull as we did so. Brisbane heeled over and we carried out an emergency breakaway. I again looked at the relieved faces of the RAS Party and could tell many had thought they were going to die this night, but never one flinched. Apart from having to make up a new Jackstay no damage was done and the new blokes would at last have a dit to spin at the next beer issue! 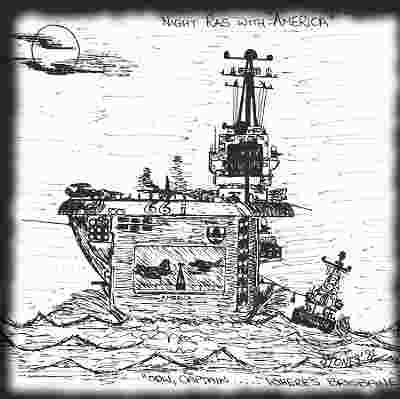 Below is a sketch from the HMAS Brisbane 1981 cruise book commemorating the event - it was sketched by The Webmaster.